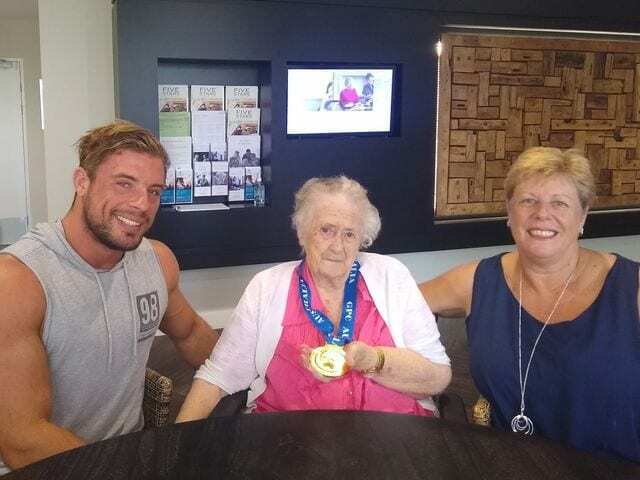 A bright, shining light coming from the Arcare Taigum café appeared to be a big ‘power lifting’ gold medal around Mary Carey’s neck, which belonged to her grandson. Mary’s grandson Brock Ridsdale recently won the Queensland State GPC Championship in power lifting! Mary was so proud to introduce Brock, and his medal, to Lifestyle Coordinator Cathy. After winning his state championship early March, Brock is already preparing in hope that he qualifies for the National Championship coming up in June 2019. The sport of power lifting and body building can be very demanding and challenging. Mary recalled a few times that Brock had to eat plenty potatoes to bulk up his weight. Tracey, Brock’s mother and Mary’s daughter, laughed about the lifestyle of her power lifting son. ‘I’m glad he no longer lives at home – he can take care of his own dietary requirements, himself!’ she said. Brock’s experiences with power lifting has educated some at Arcare Taigum of the strenuous training and lifestyle demands that comes along with the sport. Lifting heavy weights works together with portion-controlled diets and macro-nutrients; aiming to build muscle mass. Mary is Brock’s biggest fan and is over the moon about Brock’s achievements. Brock shows great determination and commitment to his sport, and she couldn’t be prouder. Cathy thought it was fantastic to find three generations of Mary’s family sitting together, celebrating in the Taigum café with a coffee. ‘We love seeing families spending time together in our café and living spaces,’ said Cathy. The Arcare Taigum café has become a central spot for socialising and catching up with friends and family. Everyone at Arcare Taigum wishes Brock the best of luck in his next championships, with lots of potatoes!